Has Bitcoin’s price hit rock bottom yet? A Cboe options analyst claims that the markets are yet to, based on the final outcome of this rally. Over the past few days, the cryptocurrency markets have slowed. However, Bitcoin is showing signs of stability with the major support at $6,000. 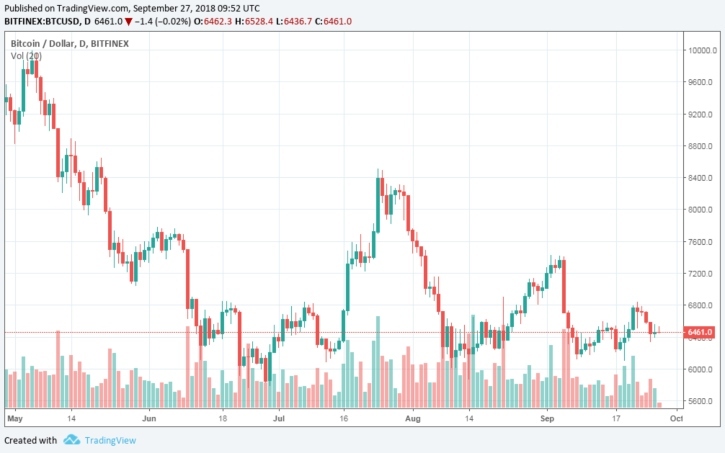 The recent recovery of Bitcoin price from below $6,000 to $6,600 has given hope to investors that the crypto markets may have already hit the lowest price possible. Further, positive comments from former Fortress Investment Group fund manager, Mike Novogratz, and several industry experts have also contributed to the heightened hope of investors, as seasoned analysts give their predictions that Bitcoin price will hit $10,000 or more by the end of 2018. For example, while speaking with Bloomberg earlier, Tom Lee, one of the most prominent crypto investors, restated his $25,000 price forecast by the end of the year. He believes that the value of Bitcoin will rally even further to $125,000 by 2022. However, crypto investors are currently expressing cautious optimism. This is in line with the call for increased caution from Kevin Davitt, a senior instructor at The Options Institute at Cboe Global Markets. He warned investors that Bitcoin and other cryptocurrencies have seen rallies before and they are usually preceded by a crash. Perhaps this is the beginning of a meaningful move higher for the cryptos after months of pressure. Only time will tell if this rally has legs…There have been at least five significant moves higher (in percentage terms) for Bitcoin since the decline began in earnest in early January. While cryptos may be moving with relatively muted volatility in the short term, there’s no guarantee that will continue. His warning regarding the price action is historically accurate. Every time the markets rallied–since the January crash–they afterward drop to lower lows. As this week gradually winds down, there is a possibility that investors will have more direction as to whether this rally has legs or not. That being said, Bitcoin prices traded higher on Wednesday afternoon. The number 1 digital currency attempted to break the recent downbeat trend. However, the upside trend remains weak for a recovery above $6,500. BTCUSD changed hands at $6,461 as at 9:52 GMT with marginal gains since the beginning of Thursday’s trading in Asia. The bulls continue to defend more strongly, the $6,000 support area. This, perhaps, could be due to two positive developments. The first is that the Internet giant Google is reportedly planning to reverse its ban on ICO and cryptocurrency-related advertisements on its AdWords platform. The company made this announcement on Tuesday as it plans to approve ads only from regulated entities in the US and Japan. The second is that US SEC has begun proceedings to decide whether to approve a proposed bitcoin ETF. Last month, the SEC rejected 9 proposed bitcoin ETF proposals, but later reversed their course and launched a review of those decisions.